The capybara (Hydrochoerus hydrochaeris) is the largest living rodent in the world. Also called chigüire and carpincho, it is a member of the genus Hydrochoerus, of which the only other extant member is the lesser capybara (Hydrochoerus isthmius). Its close relatives include guinea pigs and rock cavies, and it is more distantly related to the agouti, the chinchilla, and the coypu. Native to South America, the capybara inhabits savannas and dense forests and lives near bodies of water. It is a highly social species and can be found in groups as large as 100 individuals, but usually lives in groups of 10–20 individuals. The capybara is not a threatened species but is hunted for its meat and hide and also for grease from its thick fatty skin, which is used in the pharmaceutical trade. Capybaras are gregarious. While they sometimes live solitarily, they are more commonly found in groups of around 10–20 individuals, with two to four adult males, four to seven adult females, and the remainder juveniles. 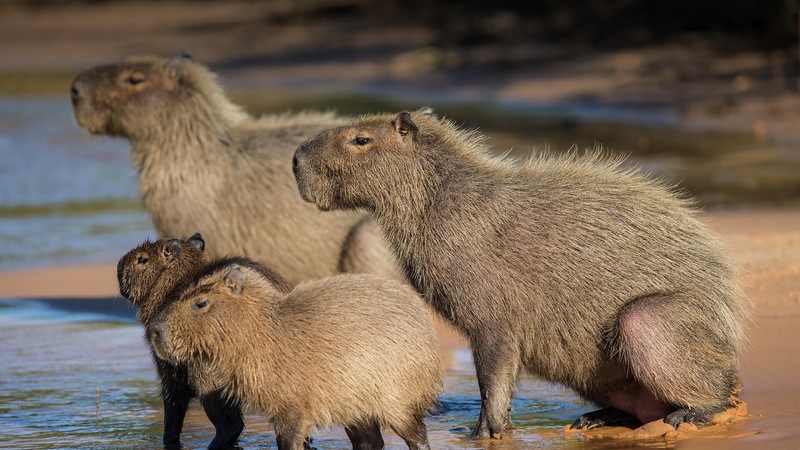 Capybara groups can consist of as many as 50 or 100 individuals during the dry season when the animals gather around available water sources. Males establish social bonds, dominance, or general group consensus. They can make dog-like barks when threatened or when females are herding young. When in estrus, the female's scent changes subtly and nearby males begin pursuit. In addition, a female alerts males she is in estrus by whistling through her nose.During mating, the female has the advantage and mating choice. Capybaras mate only in water, and if a female does not want to mate with a certain male, she either submerges or leaves the water.Dominant males are highly protective of the females, but they usually cannot prevent some of the subordinates from copulating. The larger the group, the harder it is for the male to watch all the females. Dominant males secure significantly more matings than each subordinate, but subordinate males, as a class, are responsible for more matings than each dominant male. The lifespan of the capybara's sperm is longer than that of other rodents.